For all the juvenile, puerile connotations that the name of this mod could possibly have, it's also very fitting. 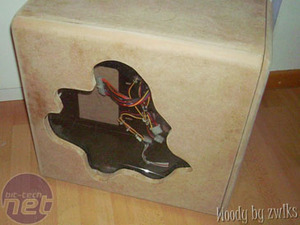 Woody is exactly as it sounds – a wooden case (built around a metal frame). It also happens to be the first contribution by one of our talented young Danish modders, zwiks. Now, Woody (and zwiks) is up here for two reasons – first of all, this mod looks pretty top-rate for a first try and its candy-colouring and great cuts show an immense attention to detail and originality. But also, if you read the worklog, you can learn a lot from the posts – both in successes and frustrations. He isn't afraid to show the less-perfect attempts and how he fixed them, as well as eagerly listening to good advice from other talented modders. But, enough of the praise – let's look at the mod! 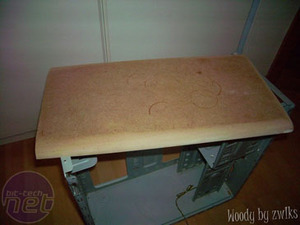 Woody started off its life as the torn down remnant skeleton of an old steel case. Hey, reuse and recycle, right? 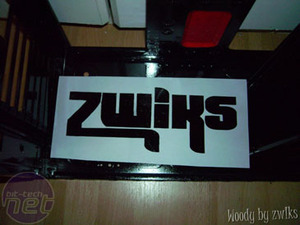 But rather than make use of the ugly (and hard to cut) steel side panels, zwiks chose MDF instead. Some careful sculpting later and we're left with some gorgeously bevelled edges. You didn't think that steel would stay the ugly colour it was, right? Zwicks took some crash-course lessons on how to paint from some of our forum members before building this little wire rig and getting his hands (and case) dirty. The rest of the case receives the same treatment as the top did – MDF carefully shaped and sculpted to keep the same curved lines. Even the window received a bit of bevelling treatment! With the case's exterior created, it was time to get painting it. There are still lots of little details that zwiks keeps adding, but in the meantime the case is shaping up beautifully. 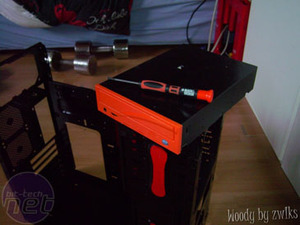 The orange candy-coat paint job is incredibly eye-catching and has really turned out well! 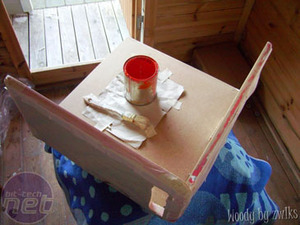 Painting turned out to be a lot harder of a task than initially anticipated, but the process is a great one to read through in his worklog to learn both what to do and what not to do when you're just starting off. And while you're reading, make sure you take a brief trip over to vote for Woody as the next Mod of the Month! Want to know who's walked away victorious from Mod of the Month in May 2008? Read on!